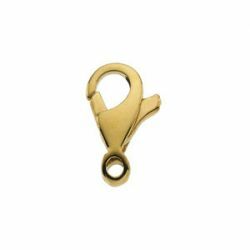 Description: 14k yellow gold standard weight round lobster clasp with ring for chains. The connector ring is closed and has no seam to open ring. 6mm by 9.25mm in length with an inside diameter of 1.0mm on the connector ring. 6.5mm by 11.25mm in length with an inside diameter of 1.2mm on the connector ring. 7.5mm by 11.25mm in length with an inside diameter of 1.2mm on the connector ring. 8.25mm by 14mm in length with an inside diameter of 1.6mm on the connector ring. 9.75mm by 16mm in length with an inside diameter of 1.7mm on the connector ring.